"Sir – At the last meeting of the T.A.A.A [Tasmanian Amateur Athletic Association] Council I asked and was readily granted permission to make arrangements for securing an Honour Board which will contain a complete record of all men who enlisted who have competed under the T.A.A.A anywhere in Tasmania, whether runners, boxers, cyclists, or swimmers and including competitors in the 5-miles Schools C.C.C. …Will you kindly allow us to use your columns to request that returned soldiers, their friends, or relations communicate with me at their early convenience, so that their names may not be overlooked…"
On Monday the 26th of September 1921 the Honour Board was unveiled in public for the first time at the Masonic hall. 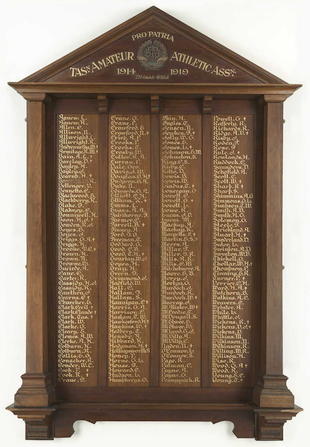 "There was a large muster of members of the Tasmanian Amateur Athletic Association at the Masonic-hall last night, when a reunion smoke social was held, at which the president (Sir Herbert Nicholls) unveiled the honour board, on which appeared the names of 220 members who had enlisted, including 45 who had made the supreme sacrifice…"
…'as we have no abode of our own in which to place it I shall be glad if you will ask your Trustees to allow of it being erected in the Vestibule of Hobart Public Library which I think it would be a most fitting place for it…." It was a retired teacher, Michael Hawkins, who first raised the prospect of the Honour Board returning to the library. Mr Hawkins came across the board while researching his great uncle William Cuthbert Hawkins who was killed in France in 1916. Private Hawkins is among the 45 soldiers on the board recognised as paying the ultimate price for their service. In a Mercury article on the 23rd of August 2016 Mr Hawkins said that he wanted the board displayed to 'bring to light the stories of those listed,', and that 'it should be located in the foyer of the library in Murray Street.' A suggestion that is now a reality. The online Honour Board is a gateway to other resources. Many of the soldiers are linked through the Tasmanian Names Index to newspaper photographs and to service records from the National Archives of Australia's Discovering Anzacs Portal. Twenty Six soldiers on this board are commemorated on the Soldiers Memorial Avenue, part of the Queens Domain in Hobart Tasmania.